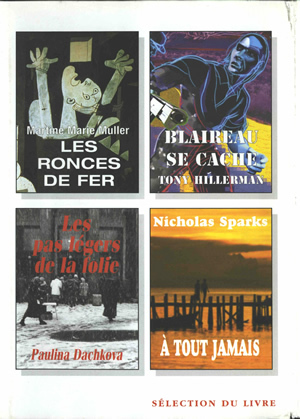 Paris: Sélection du Reader's Digest SA, 2001. This is the full and detailed view of the French Reader's Digest Condensed hardcover volume containing Hunting Badger. Translated into French by Danièle and Pierre Bondil, this volume also contains condensed novels by Martine Marie Muller, Paulina Dachkova, and Nicholas Sparks. This hardcover volume has a dust cover. On the front of the dust cover are thumbnails of the four included novels. On the back cover are press quotes for each of the four included novels, along with the Reader's Digest pegasus logo in red. The front flap displays synopses for three of the included novels. The back flap displays the synopsis for the fourth novel, and an announcement about the next volume. Binding: Red vinyl-covered boards with dust cover. The novel titles and authors are printed on the spine.